[/fusion_title][fusion_text]Tracked and Cabbed Side By Side UTV Rentals. We offer equipment for all seasons, conditions and terrains. Adding tracks to the already versatile Polaris Ranger makes it a valuable asset all year round. 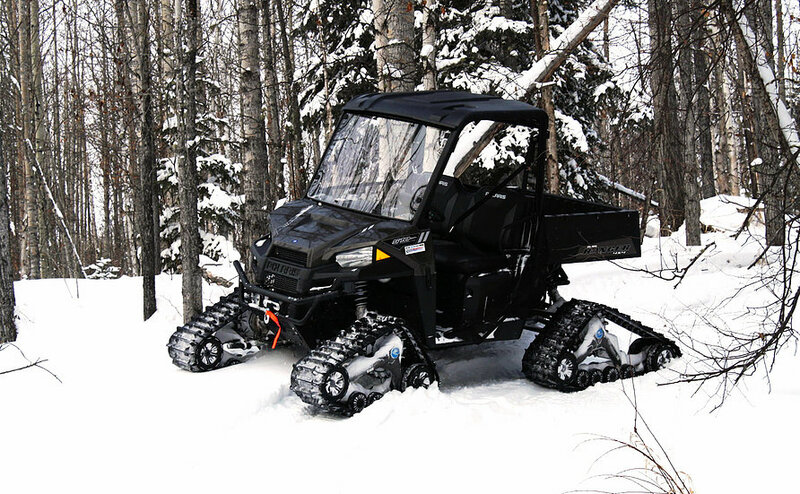 With the comfort and safety of a heated cab, many companies choose a side by side over snowmobiles to eliminate the dangers of Alberta’s harsh climate. For the same cost as 2 sleds you can Comfortably transport 2 people and the tools and equipment required to complete the job. Camoplast tracks allow easy travel in winter conditions and snow is no concern when a ranger is outfitted with a track system. There are many situations where tracks will prove their value, but winter is when they outperform all other equipment. All Whitecourt All Terrain tracked side by sides have power steering to compensate for the extra drag of the tracks.